Twitter’s liberal bias is no shocker to anyone who saw “Binders Full Of Women” at a Halloween party last year. Republican presidential candidate Mitt Romney’s slip-of-the-tongue during a presidential debate instantly became a Twitter sensation, fueling discussion of conservative gender bias for weeks after the event. 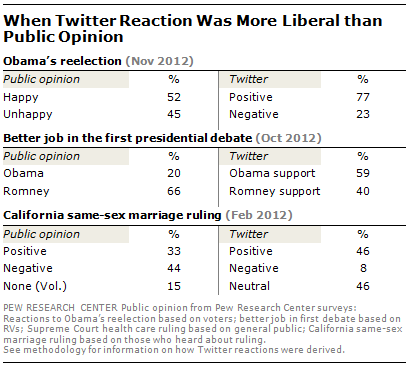 Now, delicious new survey data from Pew reveals just how liberal the Twitter universe is. And, perhaps more interestingly, when it’s also more conservative than national opinion polls. When it comes to mainstream political issues, such as President Obama’s favorability or gay rights, Twitter is decidedly liberal. But, when issues are more wonky, like the nomination of former Massachusetts Senator John Kerry, for Secretary of State, conservative opinion shines. Twitter users love President Obama and Gay Marriage. The average sentiment of Twitter updates was 25% more over-the-top with Obama’s re-election than a national-representative public opinion poll. More important, despite overwhelming disapproval of Obama’s first debate in the press and public opinion, Twitter uses came out in force to defend the president (20% of public vs. 59% Twitter). On gay marriage, Twitter was slightly more favorable (33% vs. 46%) but there was virtually zero negative sentiment on Twitter (44% vs. 8%), perhaps because it’s easier to silently judge someone’s lifestyle than say it in public. When it comes to insider Washington opinion, Twitter’s liberals are noticeably silent. 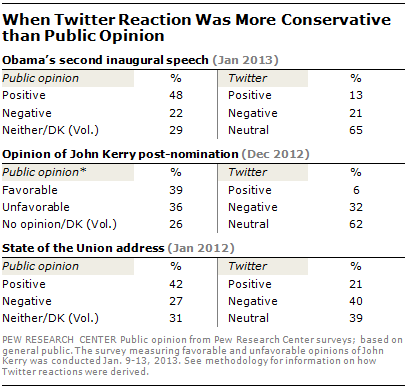 Few Twitter uses had nice things to say about his second inaugural speech, compared to the public, (48% vs. 13%) and there was virtually no support for the nomination of John Kerry (39% vs. 6%). In both cases, in the “neutral” sentiment of Twitter is higher than positive sentiment (i.e. people don’t care), conservatives have an easier time on social media. As I’ve written many times before, social media is a very biased sample of the U.S. At only 13% of population, if the highly-educated demographic of Twitter users had their way, Ron Paul would have been the Republican nominee and Chick-Fil-A would be out of business. “The lack of consistent correspondence between Twitter reaction and public opinion is partly a reflection of the fact that those who get news on Twitter – and particularly those who tweet news – are very different demographically from the public,” writes Pew. Even so, the overwhelming power of liberals on mainstream issues will make life difficult for Republicans. With a few clever tweets, Obama easily stole the social media thunder during Romney’s big Republican National Convention show. Even worse, from the “binders full of women” kerfuffle to Senator Marco Rubio’s water bottle gaffe, memes have a way of stubbornly sticking to conservatives. And, that is a big problem for the beleaguered Republican Party.